Seville’s knot of rivers and roads untangles slowly. A bridge here. A sidewalk there. A bike path. An underpass. Cities are not made to be walked across anymore. I have to pick at the different threads, untangling them one by one as the sun cooks the city streets. Some unravel easily. A sidewalk along a main road or a bike path stretching for miles. Others seem to tighten and slip from my fingers before I can pry them loose. A freeway choked with cars, fences on each side, no bridge across for a half mile in the wrong direction. No matter, if you follow the thread, they all untangle with enough time. I came for the bridge over the Guadalquivir, a river big enough for ocean ships to ply its waters with cargo from across the world. It’s a bigger string in the bigger knot of how to reach the end. The river made Seville rich. All the wealth of the Spanish empire once flowed up the giant, muddy-green tongue of water to Seville’s river ports. Conquistadors and explorers walked the docks. Magellan himself set sail from them to circle the world. But all the history in the world doesn’t create a bridge south of Seville. The cathedral dominates the old town of Seville, sprawling out with its towers and stone-carved walls. Nearby, the Alcazar, a Moorish fort turned royal palace, rises with a line of visitors stretching into the street. In the Plaza España, I pass murals from across Spain and stop to stare at the many places I’ve walked through. Pamplona, Burgos, Logroño, Leon, and Pontevedra all conjure memories. The day I met Clement. Exploring the city streets with Jorgelina and stumbling on a witch burning festival. Drinking beers with the Germans. 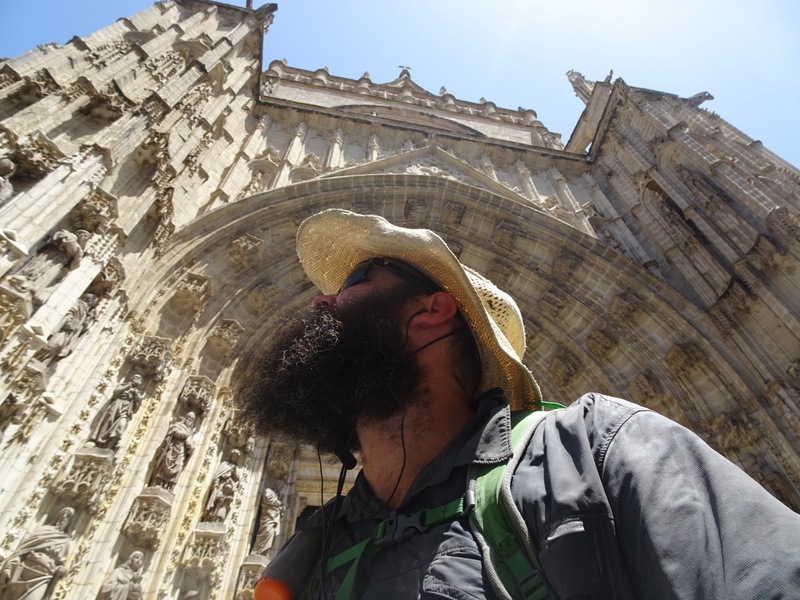 Counting seven hundred Camino pilgrims with Daya as we walked south. They make me think of different days, different knots untangled in the long string back to Kinnarodden. I slip out of the city on a bike path, then trade it for a dirt road along a side canal of the river. Seville’s chaos shrinks behind me. The hundred different decisions about sidewalks, paths, bridges, and roads fade in my memory. They don’t matter anymore. It might have pushed me forty miles from the coast, but I’ve crossed the mighty Guadalquivir and another knot lies untied behind me. The great unraveling continues. You were dealing with those knots even before you set foot in Europe. Savor the last 40! 6204.4 miles? You are amazing and a little crazy too, in the best of ways. May the last 40 be lined with kids throwing candy bars and generous ice cream vendors selling that kind with the chocolate fudge on the bottom (although I’m sure it overpowers the other flavors). Take care friend!